I returned to Twickenham on Saturday. It’s really good to be back. I missed Alice, my children and the insanely stupid dogs. We’re now all in the UK. The children are all at school. NYC Party – On me! In New York, we receive a ridiculous number of junk phone calls. So I was a bit cautious when a caller said they were from one credit card company. The caller was reporting an unfamiliar transaction. I ended the call and went online. 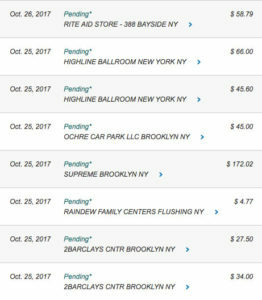 I was surprised that there were about 10 bogus charges in about 5 hours the previous night. 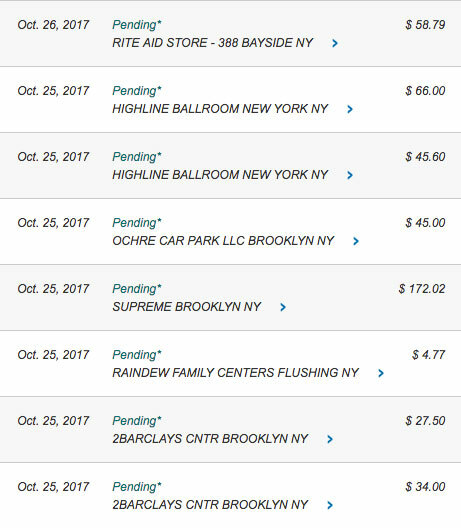 Somebody bought clothes, drinks at the Highline Ballroom, parking in Brooklyn and souvenirs at Barclay’s Center. Almost $1,000. Not bad for one night out. Honestly I can’t figure out how this happened. The card never left my sight. Anyway, I took it as a sign that it was time to hit the road and escape from New York. Better luck next time! Readers of this blog know I’m a student of the River Thames. Our segment of the Thames is semi-tidal. Teddington Lock is upstream and operates as a typical lock. 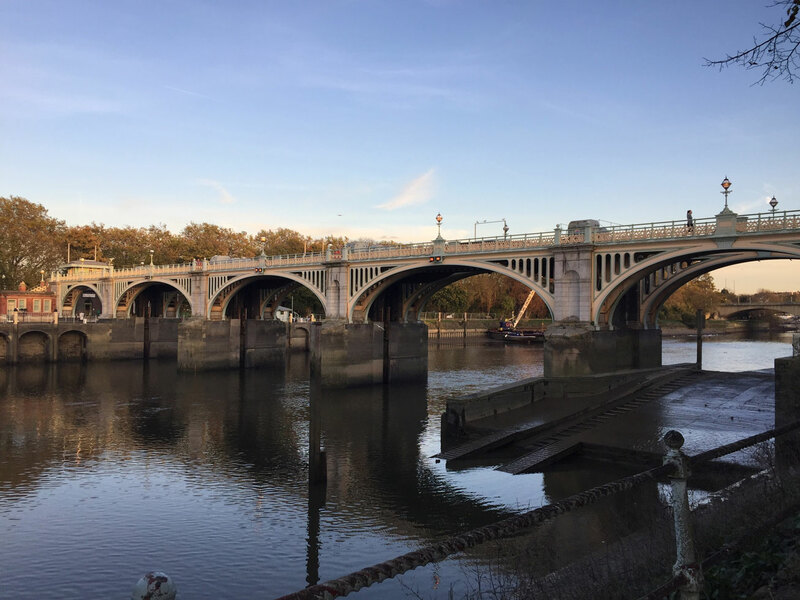 Richmond Lock is downstream and has a movable weir that is raised for two hours either side of high tide. The river is tidal for two hours of each 13-hour tidal cycle. At all other times it flows like an ordinary river. Below Richmond Lock the river is fully tidal. It empties almost completely at low tide, depending on recent rains. Near the middle of our segment there’s an obelisk marking the boundary of responsibility between the Environmental Agency and the Port of London Authority. So the Thames is managed this way. 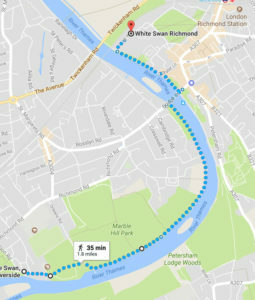 As a result, a canoe can navigate between the White Swan Richmond and the White Swan Twickenham any time, any day. Except during November. Each November, the weir remains raised for the entire month. Our segment of the river becomes fully tidal and drains at each low tide. When the river is drained, crews can haul out a year worth of debris. Last summer an operator at Teddington Lock told me about the lock’s submerged works and some similar infrastructure at Richmond Lock. In the next week I’m planning a bike tour to photograph the locks at low tide. Stay tuned. Bletchley Park – early cloud service? 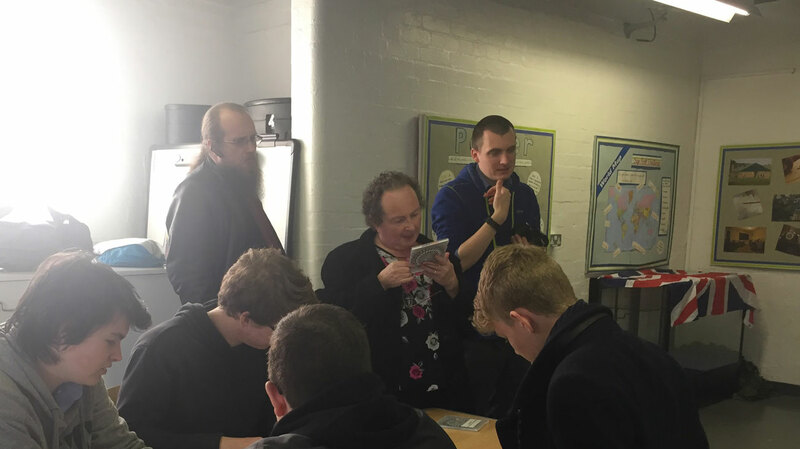 Yesterday I accompanied Harry’s Computer Science class on their field trip to Bletchley Park where the Enigma Code was broken during World War II. The guided tour and workshop were fascinating. 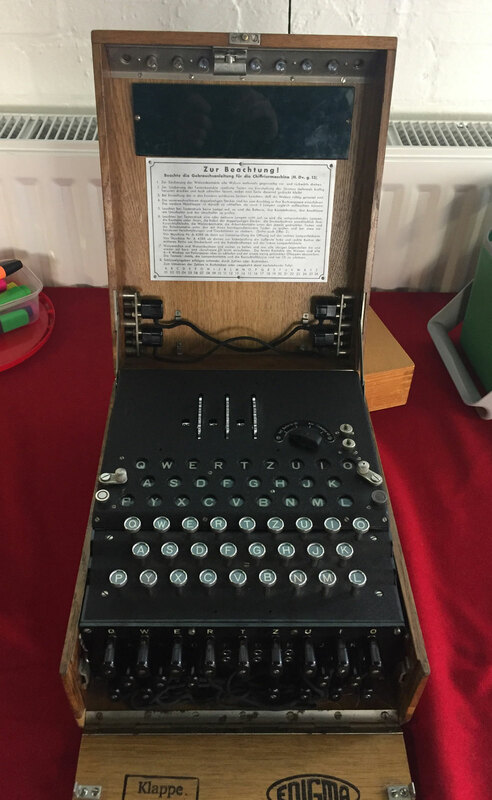 We used an original three-rotor Enigma machine and learned how they worked. Nine thousand people worked at Bletchley Park during the war. They managed to maintain complete secrecy. Breaking Enigma was considered impossible. Turns out that German errors helped the British break the code. Certain messages always started or ended with consistent phrases like “Weather report” or “Heil Hitler”. These could be used as references on which to base the daily decoding. One station in North Africa transmitted the message, “Nothing to report” dependably every day. After discovering this, the British specifically protected this enemy station for the remainder of the war. It provided another daily benchmark to enable decoding. 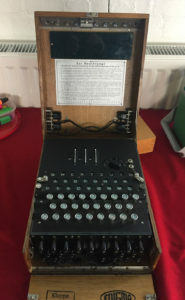 Toward the end of the war, the allies had over 200 Enigma machines distributed across North America and England. Distributed to avoid a single point of failure. Listening stations were also distributed and distant from the Bletchley Park facility. Whenever a message was collected, time on an Enigma machine was requested for decoding. It was a distributed fault tolerant system. Configured like a cloud service. In some sense the worlds first cloud service. As a consultant I typically gave myself a holiday from clients every December. Instead of working on client projects I would work on programming ‘pet projects’ or serious projects that added value to our licensed intellectual property. That’s one wonderful benefit of the software developer career and lifestyle. I truly love writing code. Every December I was able to do my favorite thing and create value at the same time. This year I’m restarting the tradition with one key difference. I’m going to write instead of developing code. I’ve been posting on LinkedIn, Medium and here. I’m writing about “Agile Agile: The Agile adoption of Agile methodologies”. First I covered teaching Agile as a second language for groups unfamiliar with it. More recently I wrote about defining an Minimum Viable Product (MVP) from a spreadsheet. I have one more article in my head right now. After that I’m going to start work on connecting these into something more cohesive. Just like the coding holidays of years past, I expect to create value. This time I’m developing a set of practices and guides to consulting services I will begin offering in 2018. Watch this space. P.S. Speaking of code. 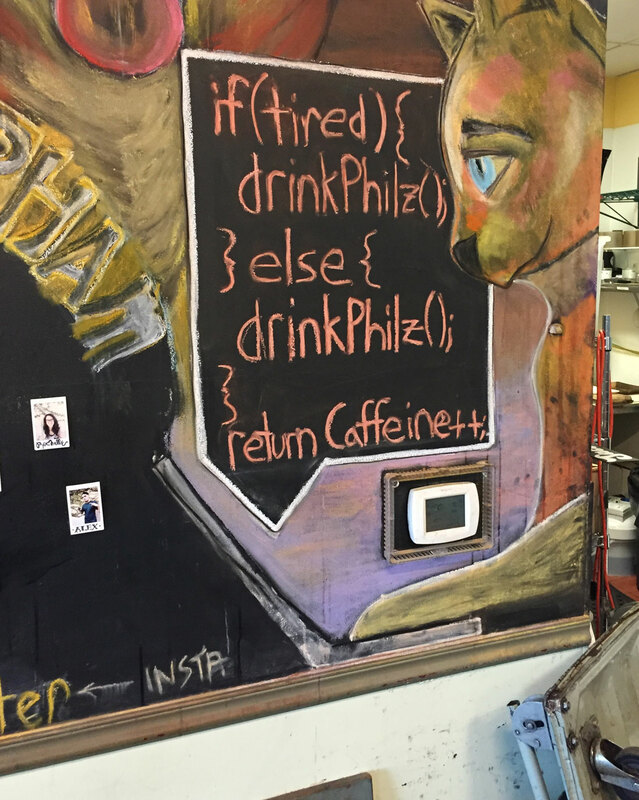 I saw this snippet on the wall at Philz Coffee in Palo Alto. It’s got a semantic error. Try to find it.